At a meeting with Fautasi captains after today’s race, Acting Governor Lemanu Peleti Mauga announced the official race results. 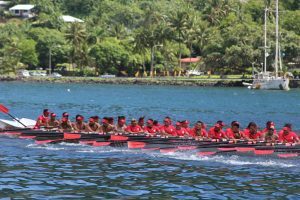 Soliai Tuipine, speaking on behalf of Manulele Tausala, said that there were problems with the start of today’s race and pointed a finger at the Captain of the Paepaeulupo’o whom he said was in front of the other Fautasi when the gun went off. He said this is what happens every year with the Aua captain and if the committee doesn’t do anything about it now, he will continue to disobey the rules. Gaoteote Palaie Tofau, Captain of Vatia’s Fuao said while he also noticed an unfair start, he cannot protest the results because the gun did go off. Gaoteote said he will abide by the Committee’s decision. 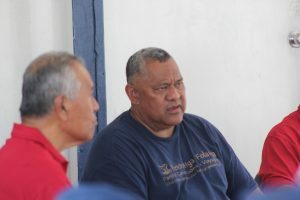 The Matasaua Captain Malaepule Fuega Moliga did not hide his disappointment saying that the committee seemed more concerned about the race and forgot about the safety of their children. He said the Matasaua was submerged in water but they didn’t get any help and their boat and crew had drifted close to the airport by the time help arrived. He was of the opinion that the committee should have called off the race and see to the safety of the crews. Aeto and the Fono boat also took on water and were unable to race. Captain of the Paepaeulupoo Leonard Liufau Sonoma who arrived late to the meeting said Aua obeyed instructions and was lined up with other Fautasi when the gun went off. His statement was backed up by Acting Governor Lemanu who said that when the committee saw that all the boats were evenly lined up, the gun was fired. After nearly all the captains had their say the consensus was to let the results of the race stand. 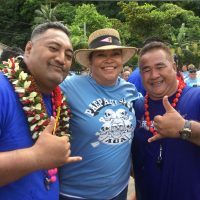 Senator Soliai suggested that the purse for the race be evenly split among all the Fautasi including the three that were unable to race. But others didn’t agree with this and suggested that it be left up to the Committee to set the amounts to give to the three Fautasi. 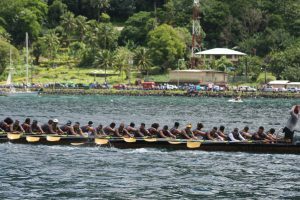 It was also suggested that the three longboats, Matasaua, Aeto and Fono Fautasi have a race on Monday. But the idea did not receive any support and the Committee decided in the end that today’s race would be the only race for the 2019 Flag Day. Why dont you guys just cancel the fautasi race from now and make use of that money elsewhere. Obviously, it is just a waste of time and it happens every year smh….the fautasi is not the same anymore. Too many lies and too many favoritism. What kind of stupid decision is this? 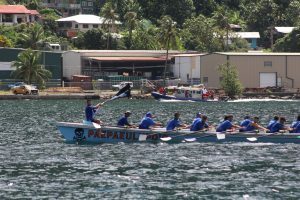 Your committee didn’t even consider the time spent each crew to get prepare for the fautasi race. Run and row everyday. Think of all the weight lost. Incompetent committee speaks for incompetent leadership ruined the race. Next year our fautasi will no longer paricipate. Ua tele tausaga o nei tuuga va’a ae o le mea lava e tasi. Ou te manatu ua o’o nei i le taimi e tatau ai ona tu’u lenei valea ae avane le tupe e fai ai nisi mea e aoga i le tupulaga. E leai lava se isi o maua se sikolasipi i kolisi i nei tuuga va’a. Ma oute fautua atu, fai ni computer library i tua i nu’u e aoga i tamaiti talavou e saili atili ai le atamai mo le lumana’i, pe faalelei ai nisi malae taalo e pei o tenisi, golf, basketball, volleyball, ma le pesipolo e maua ai avanoa mo le tupulaga i fafo. O le tala ole lava lenei faaupuga e aoga tuuga va’a e fealofani ai le fanau. E le o misi lava se tausaga ma fai fusuaga a nu’u ma isi nu’u i nei tuuga va’a. O lea lava e fealofani le tupulaga pe a leai ni tuuga va’a. Silasila outou i le malo i sisifo, o lo’o solosolo lelei lava mea uma ae ua leva ona leai ni tuuga va’a e faia. Ma’imau pe ana toto’a le tofa io tatou ta’ita’i e pei o le Susuga i le Palemia o Tuilaepa Legaoi. Na o se fautuaga lava. It is not about who won but do it right and be wise on your decision fautasi committee. I for one totally agreed with Soliai and Malaepule. The race should be cancelled and ensre that all fautasi crew are safe and either disburse the prizes equally to each fautasi or put the money to good use such as hospital, school, or scholarships for our future leaders. Remember committee safety should be a priority not the race as a fautasi race can be done but a life can not. For the safety of our people, maybe it would be a good suggestion for everyone to wear life vest. For the safety of those to ensure no one drowns or gets swept away. What’s the use of requiring the life jackets, IF these aged old relics, new high-tech, and the bathtub fautasi designs are NOT “seaworthy and viably safe” to Our rough and tumbled racecourse of 9+ nautical miles??? …this is an annual A$G sponsored UNINSURED friggin fautasi race!!! Each fautasi crew are GAMBLING by rowing out their own LIVES; during afternoon practices and the actual freaking race, at their own RISK, …and A$G is NOT liable at ALL in any point… IT’S Not worth losing any PRECIOUS life over these STUPID and UNFAIR fautasi races, period. It’s NOT just private vessels used for rescue. The village of Fagasa has a support vessel to support the Fealofani Samoa crew and to be there in case of any emergencies. The Fautasi Committee needs to set safety standards and inspect fautasi before the races. If the Fautasi is declared unsafe, it should not be allowed to race. The Fautasi Committee should include water and boat safety professionals who are empowered with inspection authority. fiberglass boats and scooped oars. First it was announced as unofficial and practice race. Now its official. Saturday KVZK TV showed a 1989 race where the Satan 2 was a boat length ahead at the starting line. The gun goes off the race begins and what happens Satan 2 is disqualified from the race. Moral of the story if Aua wasn’t in line then they should’ve been disqualified. Ever year seems like its an unfair race. Ooh Why wasn’t the police boat out in the water to help pull people to safety. Safety should always be first. These young men train so hard for this one time flag day race and every year the committee gives rules that they can’t even follow. The minute three boat needed help the race should’ve been called off. Not even three boats the minute one boat needs help it should’ve be called off. Please fautasi committee be fair and think safety first. These young men have families to go home too. All that set aside all the fautasi did an awesome job. All boats deserve a prize for participation. We all know the race is over and done but we need to work to correct this for future race. This is the same BS that had happened when Nuu’uli fautasi was sinking with water as the day of the race was rough and yet the race continued and Nuu’uli fautasi crew did not get help until after the race. The complaint by HC Soliai and Pulu, HTC Malaepule and Mageo, and others regarding the race are valid. Future or current committee please do the right thing. Revive our fautasi event instead of killing it. If the current fautasi committee decision was to have the race for the docking cruise ship and visitors your choice and decision was lousy. Talofa. Muamua faafetai e leai se ola ma se soifua na maimau ona o faalavelave sa tutupu I faiga mea o le tai. Ae ou te manatu ua tatau lava I le malo ona fuafua lelei o tulaga I le safety o au vaa, its not the first time, however e leai se mea o fai I lenei faafitauli. O la’u fesili o le a le mea e required ai e le DPS, marine patrol ia alia ma vaa fagota laiti ia I ai Uma o life vests ma safety eequipments pe o I tai, ae a o fautasi I tai e ta’i 60 le auvaa ae leai se isi e i ai se life vest? Ou te fautua atu ia i latou uma o gafa ma lenei famomoe i tausaga uma ia fai se faatatau manu e le’i tupu se faaletonu ona leai lea o se aoga o ia mea uma. La’u afioga i le Lt kovana, la’u afioga i le Failautusi o le Samoan affairs, e le Tau aoai o a Lua afioga ae o se tulaga ua tatau ona vaai totoa i ai le faigamalo ae Maise o komiti o fautasi. Manuia Lou fu’a o lenei tausaga Amelika Samoa. E sili le puipuia nai lo le togafitia. I don’t know if anyone remember when Budweiser sponsored one race and that was it. If we don’t do it right, don’t do it at all. Stop wasting time and if we lost one person during these stupid races, it will not be worth it. So stop while you are A HEAD. Give the win to Aua and everyone else, get your prize. At the end, the rowers will get the peanuts and a few beers, the chiefs will laugh all the way to the bank. Nothing good comes out of these races, not even a scholarship as one person writes. Congrats to Aua and all, however what happened to the heats they usually have? Fautasi race is a long time tradition. It is the main event of every Flag day celebration. 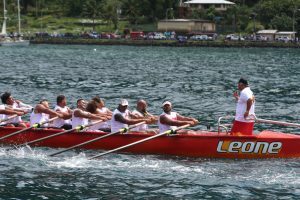 The sport has evolved and changed in various ways but yet it remained true to the Samoan saying “E sui faiga ae le suia fa’avae.” We have better and improved boats, modern training, drone coverage, faster and speedier boats but the fact remains the same, It’s Samoa’s favorite Flag event. • Let’s clean up the sport and improve it, not throw away our traditional sport. • Ban any captain that doesn’t follow the rules but let’s not punish the crew or disgrace the afio’aga. Captain Lealaifuaneva Reid always reminds everyone “O le fa’aga-Tama i le Tai o le ta’aloga a Tamali’i.” Punish any captain that doesn’t fall into that category of tamali’i like. • Let’s implement safety requirements. Quitting is not the answer. Ia Manuia Samoa. @ TamaPaepaeulupo’o. You’re exactly right but it must start from the committee, ASG and our village leaders by enforcing the rules. Four fautasi race points are abundantly clear again: 1) Race committee’s continued incompetence 2) KVZKTV’s continued confusing and incompetent live coverage of the race 3) “paepaeulupoo captain’s” continued lack of getting his boat to start fairly from the starting line with all the other boats AND 4) the fautasi race for sometime now BECAUSE of #s1,2,&3 is NO LONGER MEANINGFUL AND A WASTE OF TIME, ENERGIES, & MONIES FOR ALL – CREWS, VILLAGES, & SPECTATORS! Malie kele a gei kuuga sole,lol a ku kolu Aua ae kagofi kuu ile ku fa poo le lima, oo mai le isi kausaga ku lua ae kagofi foi kuu mai i kua le ku kolu, faasolo mai i luma ga mua ai Aua 2016 ae fai mai ele kaulia le mua, a lea la ua mua sa’o a Paepaeulupoo ae fai mai aua gei koe faia gi kuuga vaa??????????????????? ?man what is wrong with u people, haters in this committee, and all u rowers, Y? we r only human for crying out loud. Pls kaalo ile polo, Uta is barely new at the game, unlike all other captains, they been at it for yrs. Sei makou mua foi makou ia, ae ole ga foi ua kou suia faailoga masagi e kakau ga ave ile mua ku lua male ku kolu, ia ele popole ai a Paepaeulupoo makou ke le fia fai kupe, pau a o lea, fiafia e talisapaia pea le faamanatuina ole sisiga fu’a a Am. Samoa aemaise ole vaiaso paia lenei ole maliu tiga ole faaola, o oukou a ga e faa satauroina le faaola le le sa’o o kou faaiuga ma kou mea e fai. Alofa mai le tapaau ile lagi ile malo Am. Samoa se’i faamalamalama i e ta’ita’i ma i latou uma o loo taua o ta’ita’i le uiga moni ole Alofa male faamaoni. Pei ona alofa mai ole Atua ile lalolagi na aumaia ai lona atalii e toatasi ina ia le fano se tasi e faatuatua ia te ia. Se alofa ina ese o lea alofa. Alolofa maia le malo, faamaoni ia i tou faaiuga ma ia tougalulue ia male faamaoni, ole silasila mai le lagi male alofa tele ile tatou malo, ole mea lena e oo mai ai puapuaga ile tatou atunuu, pei o mafui’e, afa malolosi, lologa ma tafeaga. Paepaeulupoo lou nuu pele, malo le fai ole faiva, malo le alo, malo le faatamalii, lau pule, ua malie mata ile vaai. Ole tuuga fautasi ole taaloga, ae e fiafia ete taalo, ete malo, ae a e taalo ma lou loto faamaualuga, ete le malo, ae eke malo!!???????????????? IT’S OVER……………………NOW MOVE ON! PERHAPS MORE FUTURE SCHEDULED DOC EVENTS WOULD BE A BETTER MOVE AND MORE FAVORABLE FOR Y’ALL FAUTASI CAPTAINS AND CREW……ĀTONU E MAUA SE GRANT MONEY E FA’ATINO AI GA TAUMAFAI… CULTURAL SUSTAINABILITY OF THE HISTORY OF SAMOAS LONGBOATS AND THEIR COMPETITVE SPIRIT!……AND NOT TO FORGET……SAFETY CONCERNS!! !